We have found you a really special destination again. Mauritius is a pearl of the Indian Ocean and now you can fly these with British Airways for $1,143 r/t with taxes. The flight is super cheap, if you travel in November, you can save more than $400 compared to other airlines. Your can book this flight for the same price both at Faregeek and Faredepot, but we have found it on Travelgrove. Select as many providers as you can in the box to make sure that you’ll find this or an even better cheap flights to Mauritius. Depart from Washington Dulles International Airport (IAD) on November 10 and return on November 19 from Sir Seewoosagur Ramgoolam International Airport (MRU). You will have to change planes in London each way, layover time on the way to Mauritius is 3 hours 25 minutes and 19 hours 15 minutes on the way back. For such a long flight you will get as much as 19,446 award miles from British Airways Excutive Club, which is enough for nearly two free domestic flights in Europe, or 40% of a free flight from the UK to the US. 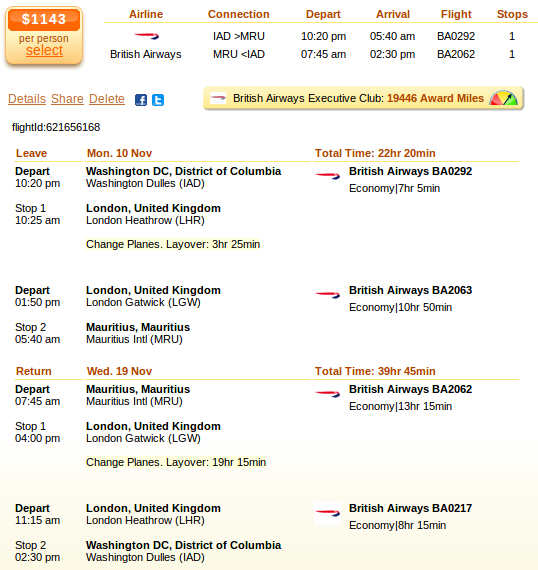 British Airways offers the best deal by far for this route, for only $1,141 r/t. The next best thing is over $400 more expensive, an Air France airfare for $1,488 r/t. Check out the list below and book the cheapest fare!